I’ve been making 2 dishes for as long as I can remember. Mujadara and Corn-Flake Crusted Chicken. If you’re anything like me, a good recipe can really elevate your favorite dishes. I’ve made both of these dozens of times in the past, following recipes that I quickly read online. Both have always come out good but never just right. So last night I decided to finally follow an actual recipe and let me tell you… SCRUMPTIOUS! Last night’s menu may seem like an odd combination but it works out remarkably well for my family. My husband isn’t a huge fan of Mujadara and prefers some sort of meat dish on the menu. That’s why I added the chicken. It’s a family favorite and tends to go well with anything. Some chicken requires a heavy sauce or gravy to make it palatable but this recipe is perfect on its own. I love Corn-Flake Crusted Chicken. It gives you that delicious fried chicken flavor without all the calories. For the longest time I’ve made this dish, but I usually just smashed the corn flakes as opposed to processing them in the food processor. It’s always been good, a real crowd pleaser, but this time I followed a better recipe from Ellie Kreiger and the taste was amazing. While I know this dish as Corn-Flake Crusted Chicken, Krieger, calls this dish Honey-Crisp Oven Fried Chicken. Same concept, just a different name. A slight variation in this recipe than the one that I am familiar with is she calls for brushing the chicken with honey before coating it with the corn-flake mixture. GENIUS! I didn’t think a quick swipe or two of honey would make a difference, but it sure did! I only wish I could have marinated the chicken in buttermilk for 2-4 hours as suggested, but I didn’t have the time. Instead I marinated them for about 20 minutes. If you’re in a pinch for time, don’t worry. The flavors were still great. If you’re in the USA, buttermilk is easy to get your hands on. However, you’re not going to find buttermilk in China, so make it yourself by adding a tablespoon of white vinegar, then add enough milk to make it one cup. Give it a couple of stirs, wait 5 minutes and there you go… a usable substitute in a dish like this. Preheat the oven to 350 degrees. Spray a baking sheet with olive oil spray. Remove chicken from buttermilk, shaking off excess buttermilk from the chicken. Discard the remaining buttermilk. 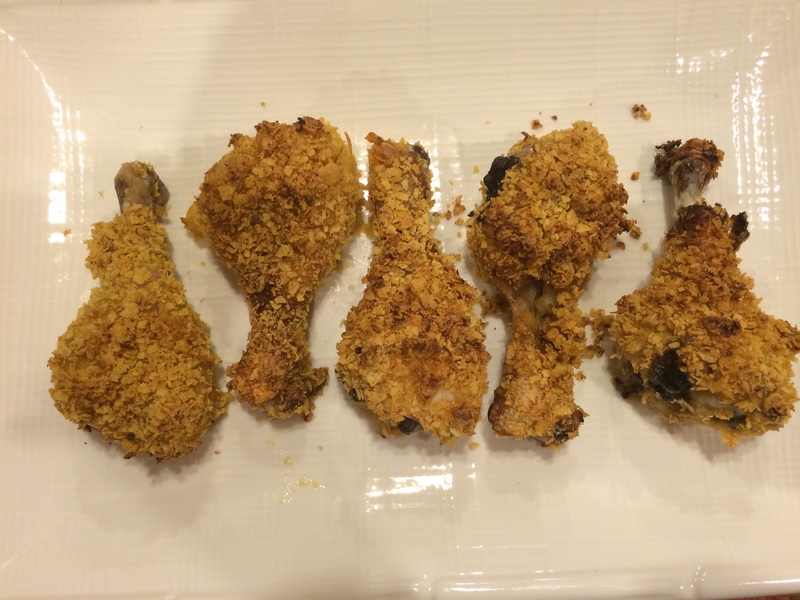 Brush each piece of chicken with honey, then dip in the corn flake crumbs, pressing hard so crumbs adhere to chicken. Spray a cookie sheet with olive oil spray and place coated chicken on sheet. Spray each piece lightly on top with olive oil spray. Bake until chicken is crisp and meat cooked through, 45-50 minutes. It came out great! My some gave it a 10 out of 10 and declared it as the best chicken he’s ever tasted. Sometime I think he sees himself as a judge on Chopped and has the right to critique my dishes to a fault. Mujadara is probably a mystery to you. 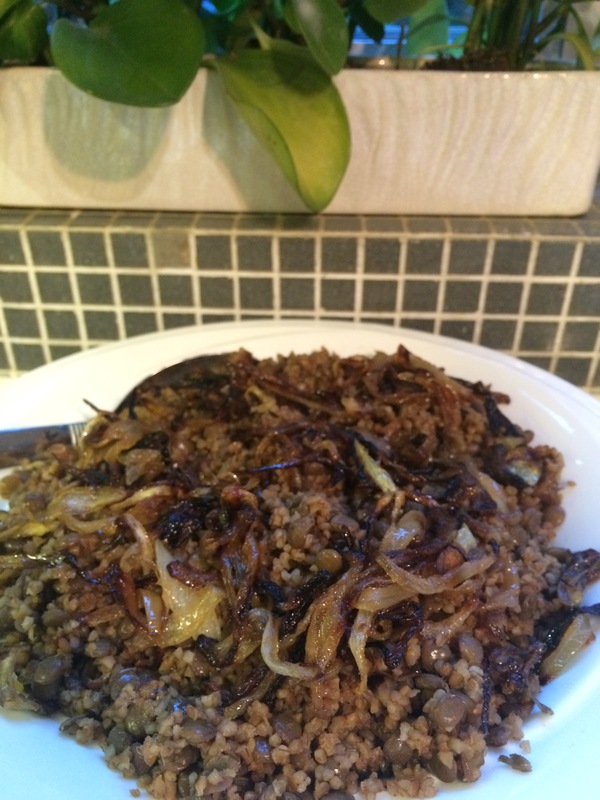 It’s a vegetarian Lebanese dish made with lentils, rice or burghul, and onions. That’s it. It’s a really simple dish. In fact, our babysitter in Germany would eat a whole pot of this in one sitting. We got home from a night out once and a whole tupperware of lentils was finished. From that point on I always made her an extra pot to take home with her. Mom: You put a cup of flour and a spoon of rose water…. Me: Wait! Like how much exactly? A cup or more than one cup. Mom: You know that glass cup I have? Just fill up one like that. Me: Mom, I don’t have that exact glass cup. So is it 8 oz? How much? Mom: It’s a cup! Just put in a cup! In a large, heavy sauté or sauce pan (with a lid), heat the canola oil over medium high heat. Add the onions and cook until deep golden brown, about 20 minutes, stirring frequently to avoid burning. Sprinkle with a pinch of salt as the onions cook. Take the onions off the heat and add 2 cups of water. Place back on the heat and bring to a boil, then reduce heat and simmer for two minutes. Add the rice or burghul and par-cooked lentils (and their liquid) to the onion mixture. (This is new to me. I used to saute the onions and put them on the side for garnish. Perhaps this explains why my Mujadara was never this awesome) Cover and bring to a boil. Sprinkle with a pinch of cumin, salt and pepper. Reduce heat to low and cook until the liquid has been absorbed and the rice and lentils are cooked through. The texture of the rice and lentils is somewhat al dente. Take care not to overcook or the mixture will become mushy. Remove from heat and season to taste with salt and pepper. Serve hot, warm, or room temperature drizzled with olive oil. For fried onion garnish, heat canola oil over high heat in a small saucepan (the small saucepan reduces the amount of oil needed for depth). When a small piece of onion dropped into the oil floats to the top and bubbles vigorously, the oil is ready. Fry the onion rings in batches until golden brown, reducing heat as needed to prevent burning. Remove and drain on paper towel. Place the onions on top of the mujadara on a serving platter or individual plates. I love recipes that I can get the ingredients for regardless of where I live. That’s the beauty of most Lebanese dishes. They rely on simple, fresh ingredients. You’ll see a lot more recipes on blog featuring Lebanese dishes for this reason.